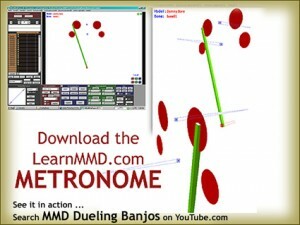 LearnMMD's METRONOME is Ready to Download! How do I find the beat in my MikuMikuDance songs? How do I time my motions to the music in Miku Miku Dance 7.39? Is there a metronome for MMD 7.39? As I started my Dueling Banjos project, I knew I was in for trouble! The tempo of that piece is constantly changing … faster and faster! I decided to make a metronome that I could tick-tock to the beat. It works! The download includes a couple of accessory items: the dots and the baton. The wider-spaced dots are OK for slower music … and the upper dots work well when your computer can’t run MMD fast enough … when it lags … as you are trying to work. Running this metronome would be the first step of a new project. Start NEW, load your WAV file. OPEN this LearnMMDmetronome.pmm dance file. Animate the metronome in time with your music. You create this “dance” first … then add your models. After you have enough of your action in place, you can delete the metronome from your project. If you already have a dance that you want to refine … create the metronome dance on a NEW stage using the same WAV file … andsave it. Then copy all of the bone data to your existing dance. The metronome uses Dummy Bones 1,2, and 3. You might have to reassign the bones to uses numbers not used in your existing dance. OR … What I did on my Dueling Banjos project … I filmed a live action video of my grandpa clapping his hands to the ever-changing beat. I set that video as a background AVI … and then matched the metronome to the clapping while keeping an eye on the “scope” to better hit the beat. It works. 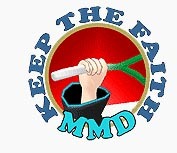 That will be a future post, here, on LearnMMD.com!